Most dogs love to chase after squirrels or bark at the neighbors, but how do you keep such a large canine in your yard? Big dogs have a huge amount of energy. Most dogs love to chase after squirrels or bark at the neighbors, but how do you keep such a large canine in your yard? When you need to fence in a bigger dog, keep these things in mind. A four-foot high fence might be enough to keep a smaller breed in line. But it probably won’t do much to scare a Husky, Golden, or Lab. At minimum, you should aim for a fence that is six feet or higher to prevent jumping. Upgrading or making an existing fence taller won’t be sufficient; you’ll have to start from scratch. Install a brand new, taller fence instead. Choose high quality wood or vinyl for these fences, since the strength of the fence matters just as much as how high it goes. 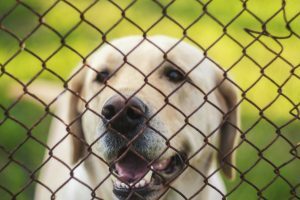 If your furry friend is especially talented at climbing, a chain link fence probably isn’t in your best interests. After all, a chain link fence provides convenient footholds! A paneled fence is a better idea, since there is little to give them traction. Birdbaths, planters, and other large objects should not be kept near the fence, either. Maybe your dog loves you, but isn’t exactly friendly to interlopers in his kingdom. Either way, putting in a privacy fence will help you feel better, and help your dog too. Privacy fences will keep your dog out of sight, so other neighborhood dogs won’t be able to spot them. While an invisible fence may provide a worthwhile option, you might not always be able to choose that option. For instance, an invisible fence might not be allowed in your neighborhood or in your town. Invisible fences are often paired with a shocking mechanism that indicates where the boundary line is. If your dog isn’t particularly well-behaved, a constant and sudden shock won’t be much help. Lastly, you want to make sure that the dog fences you choose discourage any possibility of escape. Barriers and boredom are two obstacles your dog will see as challenges to overcome. You can avoid this by playing with them while out in the yard, or taking them for frequent walks. Larger dogs need more exercise, and sticking them in a small yard with a tiny fence won’t end well, for you or for your best friend. This entry was posted on Friday, August 18th, 2017 at 10:20 am. Both comments and pings are currently closed.